Number : Season 15, episode 2 of 6. Which One : K9 joins. First UK Broadcast : 1 October – 22 October 1977. Plot : A moonbase on Titan, is attacked by a malevolent space-virus. The Doctor is also affected and travels to a nearby hospital base, on Asteroid K4067 – home of new robot companion; K9. Whats good : K9. Dr Marius. Leela. Going into the Doctor’s brain. The concept of the Swarm virus. Whats bad : The nucleus appearance. The pacing. The furry scaly face look. 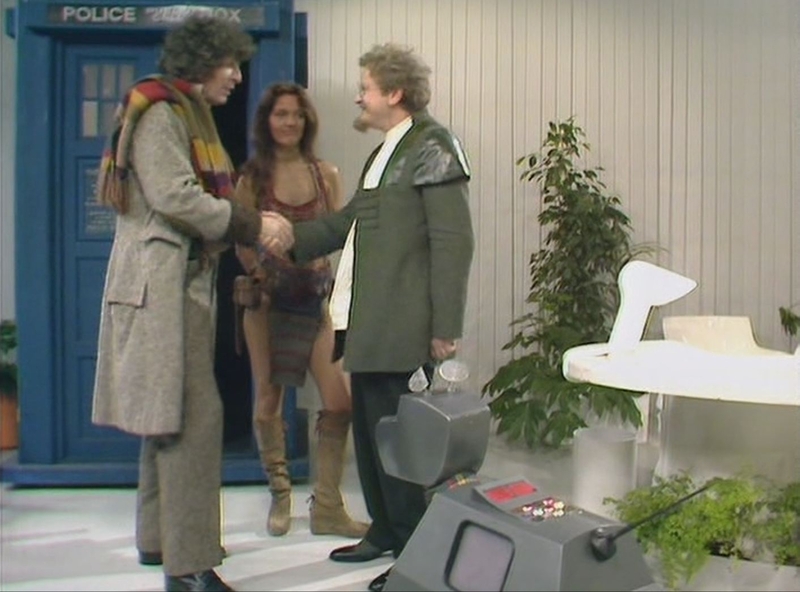 Review With Spoilers : The Invisible Enemy is the 2nd episode of seadon 15 and marks the 1st appearance of new companion; K9. K9 is the robotic pet dog of Professor Marius – who the Doctor meets, having been transferred to a space asteroid hospital as a patient, having contracted an infectious and intelligent space virus. Everyone infected with “The Swarm” virus, takes on a controlled hive-mind connection – to each other. Including, the unfortunate base personnel of Titan – who are all infected. They all have the need to create conditions on the Titan base to allow The Swarm; to breed. After infecting the unfortunate victim, the swarms trademark – is a scaly and furry white appearance, on the victim’s face – as they are taken over and controlled. Regular Who character-actor; Michael Sheard, makes a re-appearance as Titan-base Supervisor Lowe; who becomes infected and embodies the Swarm in this (at least for 3 parts – till Nucleus appears!). For a man, who once evily terrorised children as – Headmaster Mr Bronson, in Grange Hill. Sheard was no stranger to the playing the badguy with his trademark cold, detached demeanour. Sheard also spent most of his Who career playing the badguy too. The monster in this; “Nucleus” – of the Swarm, doesn’t make an appearance until the part-3 cliffhanger. It’s not really needed though, as the human infected – are more than effective monsters. Nucleus seems bolted in, as a shock cliffhanger moment and isn’t that well designed either. Appesring as a lumpy cancerous growth stage or as a furry crab. Probably, just so Who could say that The Invisible Enemy did actually have a monster – in it. But it is not really needed here, as Sheard himself, is more than effective. The virus also works better (in terms of the plot) – when it was unquantifiable. The Invisible Enemy is – like alot of other Grahan Williams episodes. A little uneven in places, due to odd pacing and some un-necessarily drawn out scenes. Like all of the asteroid hospital scenes. It never quite gets out of second gear though, despite an interesting Fantastic Voyage homaged journey into the Doctor’s owb brain, which is something we haven’t seen before. Strong performances from Sheard, K9 and Leela help proceedings but not enough to raise the bar – above average episode fodder.